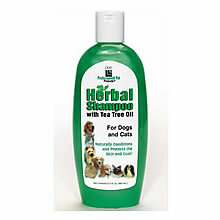 PPP Herbal Shampoo contains Tea Tree Oil and Aloe Vera which together naturally soothe, condition and protect the skin and coat. For use on dogs and cats. Available in sizes: 15.5 ounce only.